Good-Looking Female Artist Looking at Camera and Smiling While Holding Brush to Paint and Sits at Table in Spacious Art Studio. 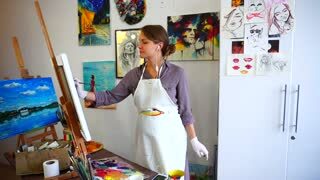 Pretty Female Artist Painting Brush and Listening Music Through Headphones and to Dance in Spacious Art Studio. 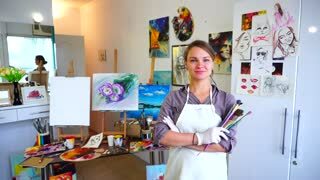 Cute Female Painter Looking at Camera, Smiling in Hand Big and Small Brush For Oil Paints, Stands in Spacious Art Studio. Attractive Girl Artist Holding Brush in Hand Depicting Flowers on Canvas at Easel, Looking Into Camera and Smiling While Sitting on Chair in Studio. Girl Artist Sits in Profile to Camera and Looking at Picture, Draws Brushstrokes and Lines on Canvas With Brush at Easel in Bright Art Class Studio. Beautiful Girl Artist Looks at Camera and Smiling While Holding Brush in Hand and Draws Picture at Easel Sitting on Chair in Art Studio. Beautiful Girl Artist Looks at Camera and Laughing With Brush in Hand, Mixes Paint on Palette and Paints, Sitting at Easel on Chair in Art Studio. 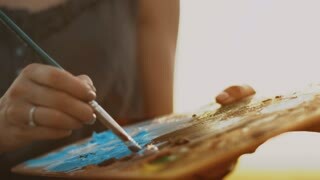 Young artist holding paintbrush and color palette while working on oil painting at studio. Portrait of beautiful young painter holding paintbrush and color palette while working on oil painting in art studio. 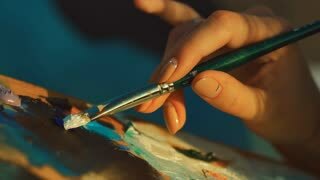 A close-up of the artist's hands holds a brush and a palette. Draw in paints. In the studio. Canvas. Contemporary art, abstract. Slow motion. Shot on RED Epic Camera.